Police searching for missing Sian O'Callaghan have found her body and are searching for another possible victim, as a man is questioned on suspicion of double murder. Police said the arrested man had identified the location of two bodies. Earlier detectives suggested two people had been found, but later confirmed searches are continuing. 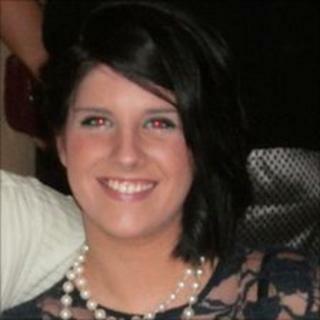 Miss O'Callaghan, 22, was last seen leaving Suju nightclub in Swindon on Saturday. Members of her family have been informed of the discovery of her body and are said to be "deeply distressed". Det Supt Steve Fulcher said: "A 47-year-old man from Swindon is in custody, having been arrested for kidnap and two murders. "The location of two bodies have been identified to me by this individual, one of whom has yet to be identified formally, but I am quite clear is Sian. "I have informed Sian's family, who are obviously deeply distressed." He added: "I want to recover these people and give them the dignity they deserve." Later, a statement from Wiltshire Police said: "The location of two bodies has been identified to the senior investigating officer, only one body has currently been found and this is believed to be Sian O'Callaghan. "The second body has yet to be recovered." On Thursday morning police arrested a man at an Asda supermarket in north Swindon's Orbital Centre. Later in the afternoon police vans arrived at a house in Ashbury Avenue, Swindon, and a white tent was put up in the front garden. Officers are searching inside and outside the property and removing items to a nearby van. Detectives are also searching a second location between Ashbury and Letcombe Regis, some seven miles east of Swindon and close to the Uffington White Horse, in Oxfordshire. An area of the road and the verge has been sealed-off and is being guarded by a number of police officers. Angus Tucker, the landlord at the Blowing Stone pub in Kingston Lisle, some five miles east of Ashbury, said customers had told him a section of the B4507 was cordoned off. "I'm told there are quite a few police around," he added. Detectives revealed earlier this week that phone records put office administrator Miss O'Callaghan's mobile somewhere in Savernake Forest, near Marlborough, 34 minutes after she left the nightclub - a journey they said could only have been made by car. Miss O'Callaghan was caught on CCTV leaving Suju, in Swindon's Old Town area, after an evening out with female friends. She lived in a flat half a mile away with her boyfriend Kevin Reape, 25. Mr Reape, who had spent the day at Cheltenham races, raised the alarm on Saturday morning when she did not return to their flat.